This one is quite exciting. Mining history in CeskyKrumlov started in the mid-eighteenth century, focusing on gold and silver and graphite. 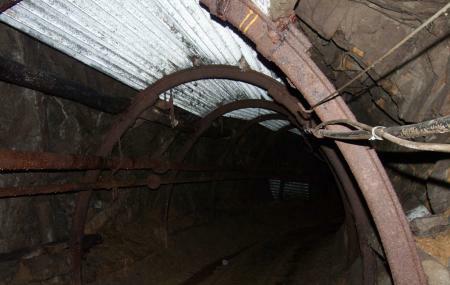 The interactive guided tour takes you into a graphite mine that has now fallen to disuse. Visitors will be putting on protective mining gear including special boots and hard helmets, get onto a mining cart, be taken deep inside the mind, and get mining method. In addition to the history of mining in this region you will also get to learn about the lives of miners and their methods of work. Walking through 2 kilometers of underground tunnels is quite an adventure. The mine is chilly. Bring warm clothes. How popular is Graphite Mine? People normally club together Divci Kamen and Museum Of Torture while planning their visit to Graphite Mine. Awesome attraction, a bit scary at first place, though a valuable insight into miners' working environment and overall conditions. Can be also guided in English (on request). Otherwise go with English speaking local to get the best out of it. Was amazing! The only reason for loss of star was that it felt quite rushed, after all the effort donning the gear we were only inside for 40 minutes. For €4 I would do it again! Nice tour to see how it was till 2003 when the mine closed (started in 1975). Only guided tours. Guide language in Czech. But translations on paper available. Don't worry if you forgot your socks... They have replacement sleeves available. Luckely for us 😉. The mine was an interesting experience taking a small train into a mountain on a hot day and then being in a cave that was freezing. I really enjoyed the break from the heat. The mine was cool seeing graphite on the walls. In some areas you could see and touch veins of graphite. Interesting tour which the guide also translated in English for us. Not a lot of details about life in the mine etc. but anyway a nice visit including a trip in a small mine train.